Change is the only thing which is constant in this world, and technological development has proved it in the best way possible. Since the advent of information technology, it has never stop form evolving due to which businesses were able to achieve new and higher limits of success. Today with the help of software, we can accomplish tasks with efficiency as well as accuracy and that too in few minutes. Several organizations have taken advantage of these new ways by applying them to different departments like operations, production, quality management, etc. One of them is trading and distribution which is challenging to manage if you try to complete all processes manually. Instead of doing this on your own you can outsource it to a specialist like Tech Support Dubai. With decades of experience in providing class apart Software Solutions for Trading and Distribution to various companies in entire Dubai, we have become a leader in the industry. We know that you can require assistance at any time as issues are inevitable and do not arise with a notice. To help you in such situation, we have established a helpline which works on a 24 x 7 basis. By calling us at our toll-free number or by writing us an email, you can register your query and complaints. One of our experts will quickly respond to it with suitable solutions by keeping your budget in mind. Today competition is intense, markets are volatile, and cost pressures are also a challenge for distributors which can stall growth and productivity. Here investment in technology can help you by saving your time as well as money. Instead of establishing your own IT infrastructure and department, it is a wise decision to outsource it to an expert who has expertise and experience. Under trading and distribution, there are several processes such as inventory management, order tracking and fulfillment, sales quotation and analysis, procurement management and delivery. Only an expert can perform them who has specialization and dedication. 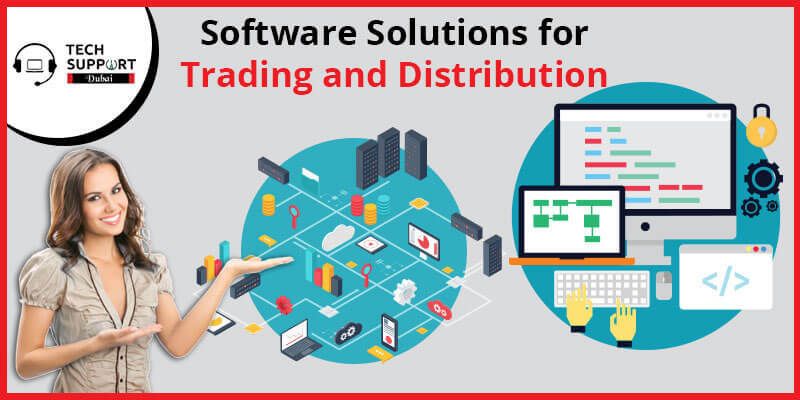 Here, a trading and distribution software solution can rescue you. With our vast exposure, we have gained in-depth insight into the functioning of trading and distribution industry. It has helped us in developing, designing and implementing quality inventory management systems which are capable of enhancing processes, containing costs, stimulating innovation, and streamlining operations. You can harness the benefits of a functionally rich ERP software to support processes such as inventory control, order processing to shipping, and accounting. It will provide you real-time insights into departments with enhanced enterprise resource planning so that your business can enjoy reduced cost, improved sales performance and order processing, increased profits, and higher customer satisfaction. Take advantage of Tech Support Dubai integrated warehouse management solutions and get a clear insight into your inventory stock as well as the status of consumer accounts for gaining an edge. It will also track performance in the past to compare it with a present scenario for forecasting future trends. Give us the chance to serve you with quality trading and distribution software solutions and get reduced business costs, increased visibility of inventory, real-time data, streamlined processes to manage inventory better and make informed decisions with our comprehensive multi-location inventory tracking solution.